To make business contacts with Realtors and real estate brokers in western Canada, you need the information in this targeted British Columbia real estate broker email database. Our human-verified business database can be the cornerstone to a successful marketing campaign. Would your product or service be useful to real estate agents in Vancouver, Surrey, or Burnaby? Perhaps you could make a Realtor's life easier in Victoria or Kelowna. If so, let them know by reaching out with this British Columbia real estate agent mailing list. From Nanaimo to Kamloops to Prince George and beyond, we have the information your sales team needs to make B2B connections! The real estate market in BC is thriving, especially in places like Richmond, Abbotsford, Coquitlam, Langley, and Chilliwack, so Realtors in this province are especially busy and hard to reach. But if you can make their job easier, they'd certainly love to hear about it, and thanks to our accurate, verified email list of British Columbia real estate agents, you'll be able to get in touch with them easily. This email marketing list contains the postal addresses, phone numbers, email addresses, and other vital details you need to reach out to real estate brokers all across the province, and we check every piece of information regularly with computers and by hand to ensure that it's accurate. 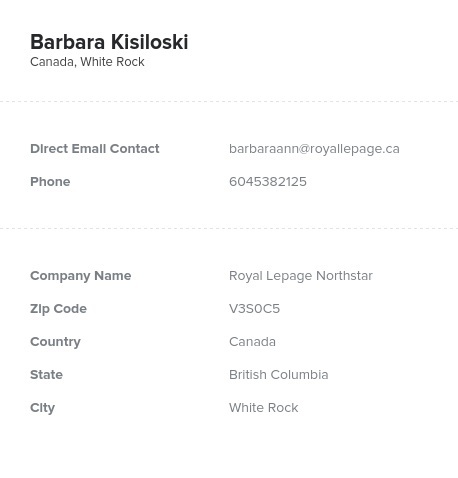 Buy this British Columbia Realtor email database and you'll soon be putting "sold" signs on more of your products!